SM Study: Is the Dancing Bear Threatening User Interface? A “Dancing Bear” is very interesting and entertaining to watch, but the more you watch the more you think, what is the point? Nicholas Griffin, regional director at Allen International equates a dancing bear to the digital experience. Everyone is looking for the digital experience: a computer-automated world that will get you what you want when you want it. But the more you think about it, what is the point? Everything is right at your fingertips in the digital world, but that is until you open your mobile app and you can’t seem to navigate the app to save your life. Gone are the days where you could pick up a newspaper and skim through the pages until your eyes land on an article that tickles your fancy, welcome to the new age where that darn search button on your favorite news app appears to be hiding from you. The information that you thought was right at your fingertips is actually not. And you’re not alone. Your customers are having the same experiences. So, what do you, as a company, to fix this problem for your customers? In order to avoid the “Dancing Bear,” companies need to ensure their customers that they can do anything with the touch of a button and that button should be very easy to find. But don’t stop there. The app or mobile site also needs to be engaging. Which sounds difficult, but it’s really not. If you create content with your customers in mind rather than your business, the content will feel tailor made and will attract more customers. Visuals are processed 60,000 thousand times faster than text, so they are also a must. But how do you know if your company has produced a product that will truly satisfy your customers? As noted in Digital Marketing, A/B testing can be very useful when a company is unsure whether their app or mobile website is, in fact, engaging, easy to navigate and performs all of the features their customers are looking for. The company can divide its’ budget between two or more design layouts and track the response rate. 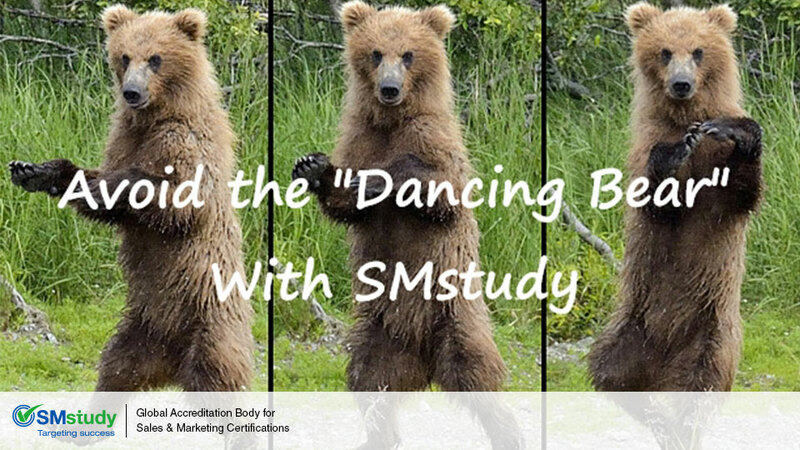 Lucky for you the “Dancing Bear” is easy to evade if you keep a close eye on it, and for any future questions in regards to your sales and marketing needs visit www.SMstudy.com.